Your teeth are meant to last throughout your life. If you’re under the impression that tooth loss is unavoidable as you age, you’re the victim of a myth. Most tooth loss in seniors can be attributed to gum disease. Early gum disease called gingivitis and its more serious advanced stage, periodontitis, can be prevented with professional dental care and strict oral hygiene habits. When caught early, gum disease can often be reversed before tooth loss becomes inevitable. The questions and answers listed below can help you recognize the signs of gum disease. Is Periodontal Disease a Natural Part of Aging? Gum disease is caused by a buildup of bacteria-laden dental plaque, not age. It can affect anyone of any age. Seniors may be more vulnerable because plaque and tartar buildup has been developing for many years. Age-related factors such as receding gums and dry mouth caused by medication can also increase risk. Are There Identifiable Signs of Gum Disease? 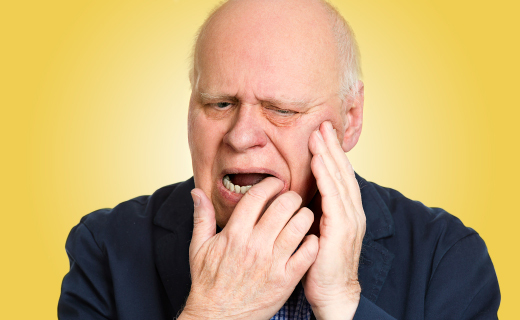 Swollen, tender, or bleeding gums, mouth sores, bad breath, gum recession, loose teeth, bite changes, and changes in how dentures fit are all signs of possible gingivitis or periodontitis. Will I Recognize the Symptoms and Signs of Gum Disease? Unfortunately, periodontal disease isn’t always easy to detect. It develops slowly over time, and early symptoms are not always present. Your dentist in Virginia can spot the early signs and recommend a treatment program before serious damage occurs. If I have Mild Gum Disease, Will I Need Treatment? Gum infection and periodontal pockets will not go away without treatment. Will Periodontal Disease Affect My General Health? The bacteria associated with periodontal disease can spread to surrounding structures, and it has been linked to heart disease and stroke. Gingivitis and periodontitis can also affect your ability to manage diabetes and respiratory problems. How Will My Dentist Treat Gum Disease? If you have mild, early gum disease, strict oral hygiene under your dentist’s supervision may be enough to reverse it. Advanced disease is usually treated with scaling and root planing procedures, medicated rinses, and gum surgery. See your dentist regularly, learn to detect the signs of gum disease, and get treatment as early as possible. Great dental care, comfortable check-up.